Social media and dog owners just seem to go together. Facebook, Instagram…anyplace we all can show photos of our dogs, we’re there! Of course, some of us….Pinch The Wheaten, cough, cough…take it to extremes. Others of us bring out the very best in people and that’s Norman and his owners. Norman is from Pinch’s third litter. He has been an Instagram star for some time and garnered many buddies. When he was under the weather a year ago, they banded together to support him under the tag #NormansGang. Well, it stuck; people never stopped using this hashtag. Then more people started using it. Then we created a page with a profile for each pup who wanted to be a "Member of the Gang." Then we started doing fun things for some pups when they got hurt or sick. That lead to a worldwide gift exchange. That lead to well over $10,000 donated to charities all over the world. Next were Hurricane Relief donations over $5000 for Texas and Puerto Rico. Then another worldwide gift exchange that over 150 people participated in. We have paid medical bills for pups. We have paid for Christmas gifts for families with nothing. Tomorrow a gift goes out to one of the members who had to put down his beloved Lexi. The hashtag has been used over 21,000 times this past year and there are now almost 270 Members. It is absolutely beautiful what is happening!! There’s more exciting stuff that may be coming…but we have to say, we are so awed that one of our guys is spearheading such goodwill in a world that can use it. Thanks Norman, Lou and Lindsay for making the dog world look so good. 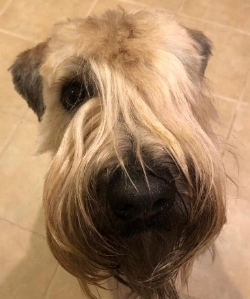 Older PostHow healthy are Wheatens?